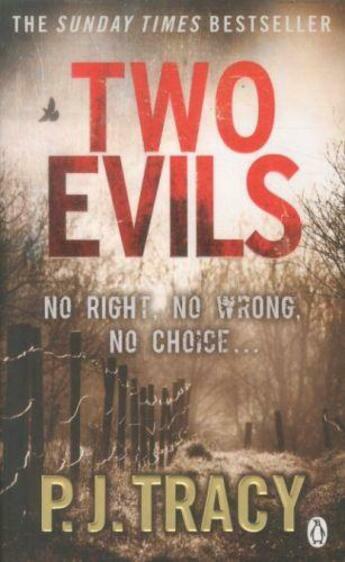 Two Evils is the latest Gino and Magozzi thriller from bestseller PJ Tracy. A missing teenage girl lies dead in a parking lot. Two young immigrants are killed in their apartment. Three men are found dead in the street nearby. As the police struggle to establish what's happened, they realise that the deaths may not be as random as they first appear. As the killings continue, homicide detectives Magozzi and Rolseath turn to maverick computer analyst Grace McBride for help, drawing her into an investigation that will threaten her life. And as the evidence mounts, it reveals terrifying intent. Ultimately, it forces the two detectives to make a dreadful choice: down which path does the lesser of two evils lie . . .
PJ Tracy fans will not be disappointed with Two Evils. Like Dead Run, Live Bait and Play to Kill before it, Two Evils produces the same crackling dialogue between the much loved Grace MacBride, Gino and Magozzi. Fans of Tess Gerritsen, Karen Rose and Lisa Gardiner should sit up and pay attention. 'Outrageously suspenseful' Harlan Coben 'A fast-paced gripping read with thrills and devilish twists' Guardian P.J. Tracy is the pseudonynm for the mother-and-daughter writing team of P.J. and Traci Lambrecht. They are the authors of the award-winning and bestselling thrillers Live Bait, Dead Run, Snow Blind, Play to Kill and the Richard and Judy Book Club pick Want to Play? All five books feature detectives Gino and Magozzi and maverick computer hacker Grace McBride. P.J. and Traci both live near Minneapolis, Minnesota.